Radios have been one of the more important technological devices for more than a century. From their beginnings in the early 1800’s until the new developments in recent years, radios have helped to provide communication as well as entertainment throughout the society of many cultures. The early years of the radio technology began early in the 1800s, but the actual invention cannot be attributed to only one person. During this time period, several inventors created and improved upon the technology that became the radio as we know it today. Once referred to as wireless telegraphy, radio technology has always included electronic signaling between a transmitter and one or more receivers. In order to accomplish this, there are many several pieces of technology that fit together. The first major breakthrough in the radio technology occurred in 1895 when the first patent for the radio was granted to Guglielmo Marconi. Though the idea was around, the actual devices that made the technology possible was not readily available until 1901. For this era, the radio technology was limited to communications with ships in case of an emergency. In 1907, the first commercial transatlantic radio service was created. From there, the technology continued to draw interested engineers and inventors from all sorts of industries. During the late 1800s, Nikola Tesla made several advances that got people interested in the radio technology. In 1893, he presented the idea in a lecture to many astonished people in St. Louis, Missouri. It was here that he actually demonstrated the wireless radio technology that other people were trying to produce in the form of an effective and reliable device. With many great minds working on this idea, it wasn’t long before radio stations began to pop up throughout the world. In the United States, there is speculation about the actual first radio station. Much of the debate lies in the actual definition of what a radio station constitutes as well as what they were supposed to do. KCBS is often regarded as the very first commercial radio station in the country, but there are others that produced regular radio programming and other services around the same decade. KDKA in Pittsburgh, for instance, began producing communication over the radio waves in 1920. In 1919, a University of Wisconsin-Madison radio station boasted the first human speech to go out over the airwaves. It was only a matter of two years before music was one of the more common uses that people were using the radio for. The first radio frequency used was the AM frequency in 1906 during World War I. Because of its reliability, it was also the most popular frequency for broadcasting beginning in 1920. The AM frequency remained the dominant frequency for broadcasting for over three decades. This period is often referred to as the Golden Age of Radio. Radio stations during this time produced a wide variety of entertaining programs. In addition to music, radio stations also played dramatic episodes of programs, such as Amos Andy and Superman. Radios also became the preferred method for communicating the news of the day. Â While the AM frequency was popular for broadcasting throughout the 1950s and beyond, researchers began developing the FM in the 1940s as an alternative to FM. This method became popular during the 1960s and took hold throughout the 1970s. It was more popular than the AM signal because it could transmit on any frequency. Although its original purpose was intended for classical music lovers and educational purposes, the FM method was a favorite for rock music in the 1960s. It wasn’t until 1978, however, that the FM programming had more listeners than the AM. In recent years, radio has made even more developments that have made listening to your favorite music even easier. With a simple internet connection, you can listen to streaming audio from almost any radio station all over the world. A new trend in radio broadcasting is also the podcast. This is where individuals put together a recording that resembles a radio show and then post it online for anybody to listen to. In addition to these developments, there is also the creation of the subscription-based radio services. Sirius and XM radio are not controlled by federal regulations in the same way that normal airwaves are governed. This gives both listeners and broadcasters more options to fit their listening pleasure. Made popular by Howard Stern, these radio services are also commercial-free, which is another great advancement in the radio industry. With the advancements that have just been made in recent years, there is no telling where the radio technology will lead to next. Instead of television, the wide variety of radio programs are becoming more enticing to people throughout the world because of its availability and simplicity. Curiosity was the undisputed robot superstar of 2012. Ever since she set down on the red planet in August, Curiosity has been behaving in true 2012 style: updating software, checking in on FourSquare and taking hipster-tastic photos. How would you like a glimpse at the crushingly bleak future that awaits you in the inevitable robot uprising? This DARPA-funded Cheetah bot could chase down the world’s fastest man. What chance do you have? ASIMO is still the best modern bot. Awww, look at her little hands and cute bent knees. She looks like an astronaut! But when you see a few in a room together, you start to wonder what they talk about when they’re alone. Sand Flea is an 11-pound robot that drives like an RC car but can jump 30 feet in the air when it needs to. A human equivalent could leap over a 30-story building in a single bound. Boston Dynamics has worked on multiple robotics projects for the U.S. military, but Sand Flea would double as an awesome kids’ toy. Sexiest robot dance moves or arachno-bot ready to kill? You decide. As cute as any non-anthropomorphic robot has a right to be. Boston Dynamics is hard at work designing bots for all terrain and every situation, just to be sure we have no place to hide when the machines rise up Terminator style. You thought you could go five minutes without listening to “Gangnam Style,” didn’t you? Well, sorry, but robots love it. Expect to hear PSY blasted over the state-run TV stations 24/7 once the robots gain control. What a stud. Check out more of PETMAN’s adventures, or just watch him do push-ups like a robot Rocky. 70 CENTIMETERS : UNICEF’s Digital Drum is designed to help rural communities in Uganda that have difficulty getting information about health, education and other issues. These solar-powered computer kiosks, which come loaded with educational content, are made of locally available metal oil drums and built to be durable against the elements. The first Digital Drum was installed in March at a youth center in the northern Ugandan city of Gulu, and UNICEF plans to deliver the devices to all parts of the nation. Sour milk? Don’t throw it away! German biologist and fashion designer Anke Domaske. Fashion designer and microbiologist Anke Domaske poses with a pitcher of milk, milk fibre and milk yarn. 60 CENTIMETERS (THE LENGTH OF A SHIRT) : The 28-year-old German biologist and fashion designer Anke Domaske creates clothes using a material made from sour milk, from which she extracts protein fibers that are spun into yarn. The result is a flexible fabric called QMilch that feels similar to silk. Domaske was inspired to create a material for people with textile allergies after seeing her stepdad, who suffered from a blood cancer, react badly to various fabrics. QMilch takes about an hour to make, and its production doesn’t require any pesticides or chemicals. A dress or shirt can be made from roughly 6 L of milk. The line ranges from $200 to $270, making for green fashion that’s gentle on the environment — and shoppers’ wallets too. French baker builds baguette vending machine . 73.2 METERS (120 BAGUETTES LAID END TO END) : Americans have their late-night slices of pizza, and now, thanks to an entrepreneurial French baker, Parisians will have their late-night baguettes. For 1 euro, or about $1.35, hungry night owls in Paris and the town of Hombourg-Haut in northeastern France can get a nice warm baguette well after the country’s roughly 33,000 bakeries have closed for the night. Jean-Louis Hecht told the Associated Press he got the idea from living above the bakery he owns and having customers knocking on his door at all hours, seeking a carb fix to tide them over until the morning. His machines can hold up to 120 precooked baguettes at a time. In his first month he sold 1,600, and in July, his machines moved 4,500. 100 METERS : When the city of Copenhagen spent 3.5 billion kroner ($640 million) on a new waste-to-energy plant — the largest environmental project in Denmark — officials didn’t want it to be just a 100-m-tall incinerator. They needed a way to turn the waste-treatment facility into a tourist destination, so they solicited bids to integrate the structure into the city. 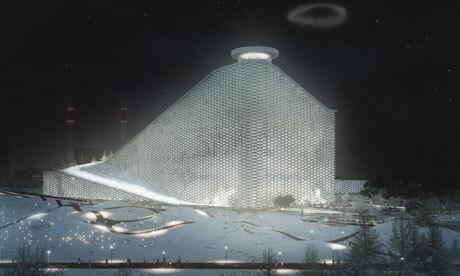 The winning architect, Bjarke Ingels, designed a 425-m-long, 31,000-sq-m ski slope with areas for skiers of all skill levels. 412 METERS : Kuwait City’s newest skyscraper spirals up from the sand, but al-Hamra Tower is no desert mirage. The centerpiece of the booming Arab city, it stands tall in a challenging climate. The tower needed a shield from the blistering Arabian Desert to the south while preserving sweeping views of the Persian Gulf to the north, so architects Skidmore, Owings & Merrill wrapped the tower in glass and added a sweeping cut up the south facade covered in limestone. The rock face reflects the desert heat with a distinct salute to the unrelenting Middle Eastern sun. The aesthetic 90-degree curve traces the sun’s path across the sky and is punctuated by glass wings at the top, making al-Hamra seem to rise ever higher. 46.2 METERS : By day, Frenchman Yelken Octuri (a pseudonym) is a cabin designer for the airplane manufacturer Airbus. But after office hours, he dreams even bigger, putting his design skills to use on more-futuristic projects. His flying yacht sports a luxe interior that would fit right in on the Mediterranean, but its exterior is something only Daedalus could have dreamed of. Its bullet shape allows it to glide equally well through sea and air, and its stark lines pay homage to Beijing’s Bird’s Nest stadium. The yacht’s four sails tower 40 m above the water, folding down on command into the wings of an airplane with the power to propel the vessel out of the water and into the skies. An artificial cloud hovers over a stadium. THE SIZE OF A JUMBO JET : The 2022 FIFA World Cup is scheduled to be played in Qatar. It’s hot in Qatar; temperatures in the summer average more than 100F. Engineers at Qatar University have proposed a radical solution to the problem: huge artificial clouds that would float over the stadium, providing shade. The clouds would be lightweight carbon structures filled with helium and positioned by remote-controlled, solar-powered engines. The other solution, only slightly less radical, would be to hold the World Cup in the winter that year. The Boeing 787 Dreamliners new interior will create a new sensation for passengers inside the cabin. 57 METERS (WINGSPAN) : The newest beast in the skies is all about efficiency, not capacity. Boeing’s 787 Dreamliner lifted off in September after seven years in development. It wasn’t designed to be the next big thing — it holds only 264 passengers — but instead to upgrade the way we fly. Environmentalists can admire its 50%-composite body, made of lightweight carbon-fiber plastic, which requires 20% less fuel, but flyers will feel the real changes. The more pliable body allows for higher cabin pressure, reducing altitude sickness. Larger windows mean that even middle-seat dwellers can gaze into the great beyond. 61 METERS : Conceived as a monument to long-term thinking, this enormous timepiece — brainchild of inventor Danny Hillis and funded by Amazon CEO Jeff Bezos — will be 61 m tall and housed in a remote West Texas cave. Built primarily out of steel, titanium and ceramic ball bearings, the clock will play a unique melody once each day and when prompted by visitors to the site. Yet the inevitable question on everyone’s mind is, can a clock — especially one so complex — endure for 10,000 years? Only time will tell. 10 CENTIMETERS : A joint project of the University of Tokyo and Sony Computer Science Laboratories, the PossessedHand is an armband with 28 electrodes that send electricity through your joints and muscles, producing precise, involuntary finger movements. Essentially, it controls your hand. In theory it could make you play the guitar, or touch-type, or do whatever its evil will desires. Has our technology — our cell phones and iPods and cameras — stopped us from dreaming? Young artist Shilo Shiv Suleman says no, as she demos “Khoya,” her new storybook for iPad, which floats us through a magical world in 7 minutes of pure creativity. In his lab at Penn, Vijay Kumar and his team build flying quadrotors, small, agile robots that swarm, sense each other, and form adhoc teams — for construction, surveying disasters and far more. At the University of Pennsylvania, Vijay Kumar studies the control and coordination of multi-robot formations. Click to view these robots in action.